Adeona is a pair of sterling silver garnet earrings which was inspired by the Roman divinity of the same name. According to the Roman mythology, she would protect children when coming back home. The oriental shape of these earrings reminds of far lands, exotic sounds and perfumes. The deep red color garnet almost makes us think of a ripe and mysterious fruit. These earrings are very elegant and will certainly be noticed by your friends. These handmade earrings will be the original and unique touch to your outfit. 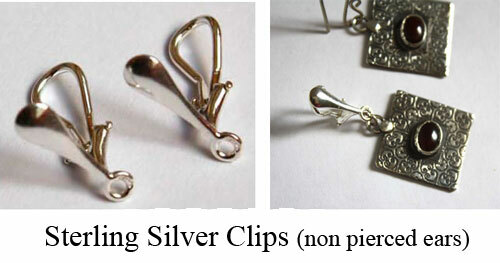 You have the possibility of changing the classical sterling silver eawires by sterling silver clips for non pierced ears. Please check the last photo to see the clips or you can also check our page about non pierced ears. Tag: earrings, silver, garnet, jewel, red stone, oriental, handcrafted jewelry, gift, birthday, bohemian, gypsy, architecture, ancient, roman, mythology, archeology, Adeona, travel, protective, exotic.